With my new daytime job I had the need to dive deeply into the pool that is SignalR, so I figured what better way to do that than try to create a DotNetNuke module that would use SignalR. There are plenty of Chat examples for SignalR, so I figured that would be a good place to start. To start, you should create a new DotNetNuke module using my templates, http://christoctemplate.codeplex.com, I used the C# DAL template, but you can use any of the C# templates. The DAL template has less information that will need to be removed than if you use the DAL2 template, the DAL2 template actually has a working sample in it). I called the module I used for this blog DNNSignalR, but you can name yours whatever you want. This will download the SignalR resources into a Packages folder inside of your module’s folder. SignalR provides a variety of resources that will be utilized, as well as an older version of jQuery which will not be used. In your project add a reference to DotNetNuke.Web.DLL in the website’s BIN folder, this will allow you to use the Route Mapping in DNN 7. In order for SignalR to work in DNN7, you need to tell DNN how to handle requests to the path /signalr/hubs/ that path won’t physically exist, due to the way the service framework in DNN7 works this is actually very easy to do. Note: If you are using URLMaster, you will need to add |/signalr to the end of the doNotRewriteRegex setting on the Regex Settings tab of the URLMaster Friendly URL Settings module (under the HOST menu). The HTML for the view control is pretty simple, with a single DNN:LABEL control that will tell the user where they can type. The INPUT file will take the message a user wants to send. The Hyperlink linkSubmit will be used for the click event to send the chat message, and finally the UL called “messages” will be used to display the received messages. You can go ahead and define the fields shown in this screenshot in the app_localresources/view.ascx.resx file, these values will get populated by DNN in the label, and link on the page. If you created the module using my module development templates, packaging the module is as easy as switching to Release mode in Visual Studio and compiling the module. Then from the DNN host/extensions page upload the module through the Install Extension Wizard. Once you’ve gone through that process you can place the module on a page. The module doesn’t do much, it really just takes a text entry and displays it on the page, you’ll need to open the page in two different browser to really test things out. You’ll notice that the messages are pretty simple and won’t tell you who they are from, but that’s okay, it was just quick and dirty sample module. If you want full blown chat functionality check out SignalRChat module demo’d at http://www.dnnchat.com. Hopefully this at least gets you started with SignalR though, using SignalR you’ll find that you can really empower your DNN modules to be responsive, without having to write a bunch of webservices to do so. Originally posted on ChrisHammond.com, all comments and discussion on this topic should be done there. tank you for this project ! 404 Not Found - "http://dnn7.1.0/signalr/hubs"
Chris , i just installed a fresh new dotnetnuke 7.1 and after install DnnChat module but the chat module does not work . any help? @Hosein, this is due to the new Advanced URL handling in DNN 7.1. Right now the only way to fix this is to manually add a DB record. I haven't looked up all the details on the fix yet, but will try to create a blog post tonight covering the details. Unable to locate a controller for http://dnndev.me/desktopmodules/GeoLocations/API/Promo/checkPlaces. Searched in namespaces: DotNetNuke.Modules.GeoLocations. Mark, I am not sure what might be causing that. I tried the above mentioned setup on your demo project and was able to get the same results. For my issue I was able to solve by taking "Default" out of mapRouteManager.MapHttpRoute' s parameters and leaving it an empty string. So I installed two different versions of this module. First, I took source from GITHUB and built it and then installed the zip. I was able to get it installed without issue and then drop it on a pge, but when I navigate tot he page it says it connected to chathub, but I cannot type anything into the box. I click on rooms to Join and it brings up an empty dialog. I uninstalled my compiled version, since the routemapper.cs did not match what was referenced here. I downloaded the already built install and installed it as well, but exact same behavior. Host Settings database entries seem to already be done when I checked. What am I doing wrong? I thought I could just install and drop the extension on a page and then have the functionality...am I confused? Ax, visit www.dnnchat.com and if I'm around I can try to answer questions there. Doing so in blog comments won't be the easiest way to get this figured out. 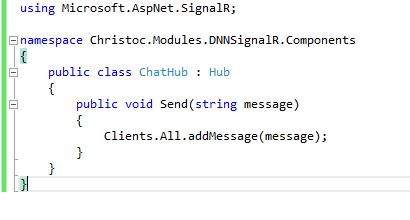 Any idea how to make SignalR version 2+ work in DNN? Because " RouteTable.Routes.MapHubs();" is obsolete (cannot be utilized). What I understood would be the way to go, does not work in DNN. I still have a problem, though..
My "public void RegisterRoutes(IMapRoute mapRouteManager)" is not empty, because there are services in use. I mean, in your module, "RegisterRoutes()" is empty, but in mine is not. I think this is why "app.MapSignalR();" in Startup() is not being run and therefore I get a 404 error for /signalr/hubs. Is there any way to make SignalR coexist with the services framework?